Mirah Belle's natural exfoliation skin soap recipes have been developed to produce a mild, skin-nourishing effect that not only heals the skin but also leaves it feeling clean, smooth and fragrant. Mirah Belle brings to you cold processed exfoliation skin soaps that retains natural glycerin. 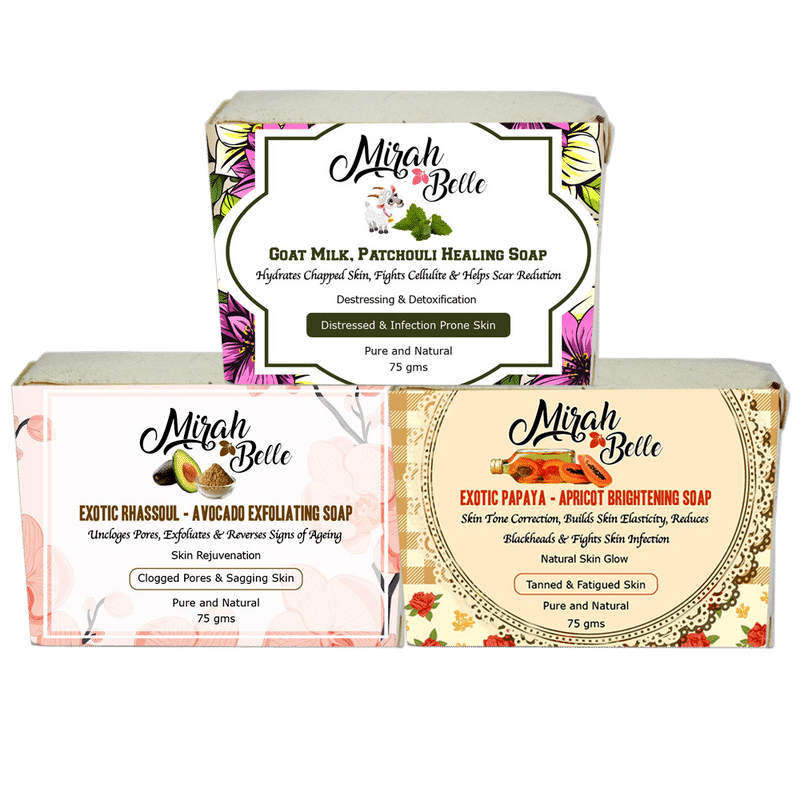 Individual skin care needs are unique, so Mirah Belle offers a variety of soap formulations for all age groups and skin conditions. Pure Essential oils are added to each variety depending on the skin type and condition. Stay Fresh and Beautiful with Exotic Rhassoul - Avocado Exfoliating Soap One of the worst beauty myths out there is that only those with oily and greasy skin need to exfoliate their faces. In reality, those with dry skin need exfoliation as much as the other skin types do in order to slough off the dull skin and promote the regeneration of new skin cells. Get Brighter, Glowing Skin with this Miracle All-in-one Papaya-Apricot Soap! One of the most common skin problems that people face is dull and lifeless skin. With the ever-rising pollution levels, your skin is bound to lose its inner glow. Moreover, as you age, your skin becomes way more susceptible to developing dark spots, or they may become a problem due to acne and other complications. One of the easiest ways to combat uneven or dull complexion is to use a brightening soap. Brightening soaps have target action to help you achieve a fairer, more glowing and even complexion. It can also help reverse sun damage and can help remove tan, so it is definitely a must-have if you have spent a little too much time in the sun this summer. Heal your damaged skin with the Goat Milk, Patchouli Healing Soap Don't be worried about damaged skin anymore. Use our Goat Milk, Patchouli Healing Soap and help your skin heal naturally. The soap is handmade by us without using any chemicals, paraben, Sulphate, SLS or Silicon. Meant for people with distressed and damaged skin, the soap works like magic to give you beautiful looking skin. The soap helps to hydrate dry skin and aids in detoxifying your skin without making it dry! It can be used to treat sores, skin irritation and acne as well. Rub generously on wet skin. Can be used on face & body.